This version of the program is made in the type of "Custom Indicator", but in fact it is a utility and it is useless to test in the strategy tester because it does not work with historical data - only with real ones displaying the current situation for the selected symbols. This version is basic and has a minimum of functionality: management of subordinate schedules by managing properties of the main chart, automatic arrangement of available symbols of trading instruments, manual assignment to the chosen schedule of the preferred symbol. When the program is launched for the first time, the symbols of trading instruments are selected from the "Market Watch" of the terminal and automatically assigned to the subordinated charts, with the order maintained in the "Market Watch". 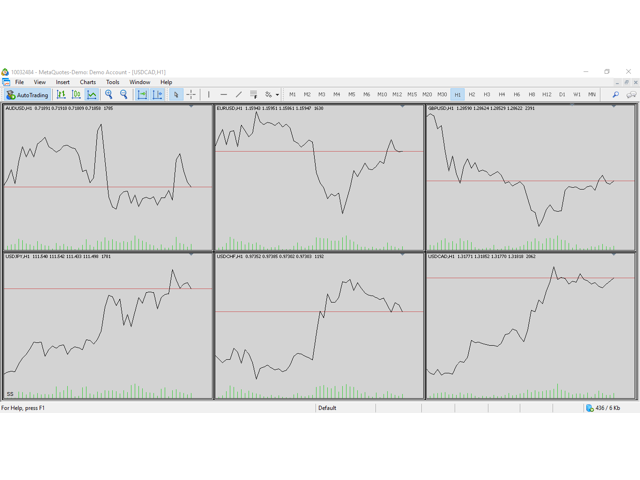 In this connection, before starting the program, make sure that the interested symbols of trading instruments are activated in the "Market Watch" and the desired sequence is set. In the future, you can reorganize it at your discretion. With the help of the program interface, the symbol of the trading instrument that is of interest is selected for the selected chart. Please note - the symbol of trading instrument of the main chart always corresponds to the latest chart and it cannot be changed later. To select a symbol the trading instrument and the appointment of its desired schedule, you need to click on the abbreviation "SS" (Symbol Select) located in the lower left corner of the main chart. As a result of this action, a list of available symbols of trading instruments, previously activated in the "Market Watch" terminal, will be opened. The next action is to click on the desired chart, the background color of the selected chart will change, and the chart will be ready for get the symbol of the selected trading instrument. Then click on the desired symbol of the trading instrument, as a result, the marked chart will begin to display the selected symbol of the trading instrument. These actions should be carried out with all the charts, where there is a desire to change the displayed symbol of the trading instrument. To exit the operation of assigning trading symbols to the charts, you must click again on the abbreviation "SS", the list of available trading instruments will be hidden. In the future, the program will display charts with selected symbols of trading instruments. To access the program settings, like any indicator, you need any method known to you, open a list of indicators connected to the main charts, select the appropriate one and open its "Properties".